comes on frequently, or if the message does not go off after the fuel fill cap is tightened and the vehicle is driven several days. 1. Check the fuel fill cap (the cap must say TIGHTEN TO CLICK), it should turn 1/4 after it's tight, then it clicks. Is the correct fuel fill cap installed and properly tightened? YES-Go to step 2. NO-Replace or tighten the cap, then go to step 13. 2. Check the fuel fill cap seal (A) and the fuel fill pipe mating surface (B). Verify that the fuel fill cap tether cord (C) is not caught under the cap. 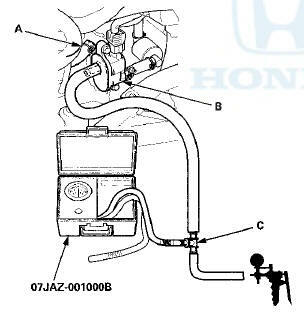 -Replace the fuel fill cap or the fuel fill pipe, then go to step 13. 3. Reinstall and tighten the fuel fill cap. 4. Clear the DTC with the HDS. 5. Start the engine. Hold the engine speed at 3,000 rpm without load (A/T in P or N, M/T in neutral) until the radiator fan comes on, then let it idle for 1 minute. 6. Test drive at 45 mph (72 km/h) for 1 minute or more. -lntermittent failure, the system is OK at this time. 7. Turn the ignition switch to LOCK (0). 8. Disconnect the vacuum hose (A) from the EVAP canister purge valve (B) in the engine compartment, then connect a T-fitting (C), a vacuum gauge, and a vacuum pump/gauge, 0-30 in.Hg, to the EVAP canister purge valve as shown. 9. Turn the ignition switch to ON (II). 10. Apply about 2 kPa (0.6 inHg, 15 mmHg) of vacuum to the hose. 11. Select the EVAP PCS ON in the INSPECTION MENU with the HDS. -Check for a blockage in the EVAP canister purge line between the EVAP canister purge valve and the EVAP canister, then go to step 12. 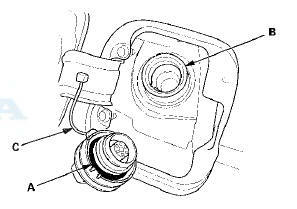 -Replace the EVAP canister purge valve (see page 11-371), then go to step 12. 13. Turn the ignition switch to ON (II). 14. Reset the ECM/PCM with the HDS. 15. Do the ECM/PCM idle learn procedure (see page 11-293). 16. Start the engine. Hold the engine speed at 3,000 rpm without load (A/T in P or N, M/T in neutral) until the radiator fan comes on, then let it idle for 1 minute. 17. Test-drive at 45 mph (72 km/h) for 1 minute or more. Go to step 1 and recheck.